"Rank within diplomatic culture is not merely indicated by how the diplomat holds him or herself. There are many subtle signs that a trained eye will pick up upon to determine a diplomat’s rank. It is not just the salary grade and title that are changed when a diplomat is promoted. There is also a change in the number of rooms and bathrooms in the home and the contents of drawers and cupboards, all in line with to the Ministry’s strict rules. According to the Danish Foreign Ministry, the embassy counsellor must have eighteen stainless steel pastry forks of the Erik Rosendahl A/S brand. 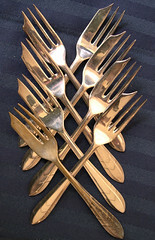 A commercial counsellor need only have twelve pastry forks, while an attaché is provided with eight. The most distinguished ambassadors have three pepper pots while the others must be content with two." I suppose, then, I shall content myself with the life of an attaché, forever gazing sadly at the commercial counsellor's additional four.